Blue might be the moodiest colour in the palette but like most people, we too aren’t immune to its charm. And when we saw eyes brushed with this iridescent, striking hue at Ritu Kumar’s show created by Lakmé Makeup Expert Donald Simrock, we were hooked. Simrock called this one the “Urban Mermaid’, and used this neat trick to create this oceanic look: He kept the lashes wet and had them stuck together like they would look if one just come out of the water. Combined with a wash of shimmery colour, it looks undeniably arresting. Move over matt and shimmer, this season was about gloss. And not on your lips but on your eyes as seen at the Caprese x Nishka Lulla’s show. Keep the rest of the look super fresh and for some added drama, add an under eye dot that can also make your eyes look bigger and brighter. Earthy, deep browns combined with dusty pinks at Payal Singhal’s show to create a palette that was fresh yet sultry, and perfect for the season. The no-makeup look has been around for a while now but we loved the bare-faced beauty look at Gaurang’s show that focused on creating a luminous glow—and looked like a rosier, fresher version of natural skin with a dash of pink lipstick to make it look flawless sans filter. At Kotwara, it was all about applying highlighter to cheekbones to achieve an almost ethereal effect. The iridescent glow was accompanied by soft, glossy lips and smudges of kohl with smoky, shaded wings of black pencil. At Ka-Sha by Karishma Shahani Khan and 431-88 By Shweta Kapur, the approach eschewed lacquers and lip tints in favour of a whimsical softer berry stain with the same hue around the eyes for a natural finish. 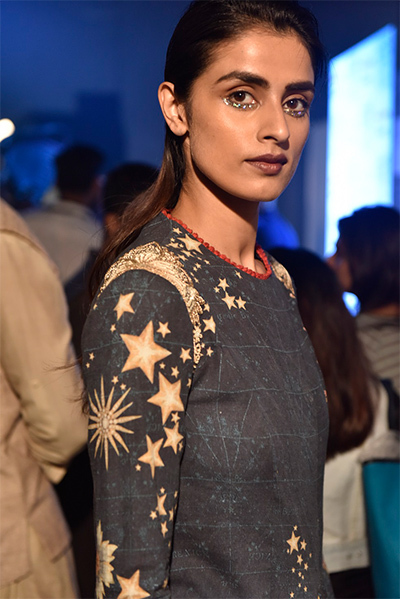 Tarun Tahiliani made eyes the focal point and the usual eyeliner got an update with the under liner trend making an appearance using glitter in an artistic way. At Shyamal & Bhumika, hair got bigger and better and was amped up to create an almost cloud-like effect. If this means, the old-school body wave is back, we are definitely on-board with this trend.